All the animals that come to us have a story. Some stories are tragic, some are heartwarming, and a few are quite funny. Each animal teaches us something and those of us who work with them every day are often surprised at the lessons these animals have for us. Here are a few stories. Scroll through, you’ll be surprised at what you learn. This big boy came to us from a lovely woman who had him for several years, since he was a baby. She took very good care of him but…. she is now married and has a toddler. They are living in a small condo in Vancouver. 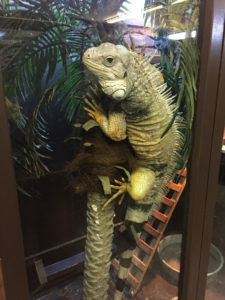 They simply don’t have room in their condo for the Iguana any more. Also the toddler had learned to open the lizard’s cage and would let him out all the time. Even though the Iguana is rather friendly, as far as Iguanas go, the lizard would eventually hurt the toddler. So the lovely woman made the hard but wise decision to surrender the lizard. The family do come to visit the Iguana when they can. We don’t recommend Iguanas as pets. They do grow rather large and don’t make good house pets. They also tend to scratch with their long sharp claws. They will also whip you with their long strong tails and they can bite. They don’t have long sharp teeth but they do have very strong jaws and can break bones with their bite. Iguanas are best left in their nature habitat – Mexico, Central America and parts of the Caribbean. 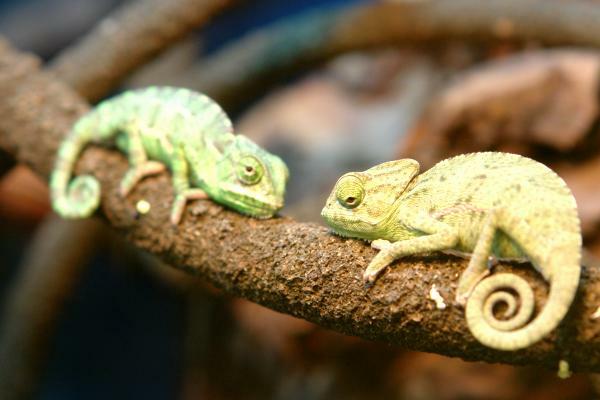 Recently we had 2 young Veiled Chameleons come to us in a cardboard box. They were brought in by an angry landlord. Apparently his international student had left the residence to return home to his country. He left the chameleons in the box with no food, water, light, heat. They had been in the box for a week before the landlord found them. He was very angry that the lizards had been abandoned. He brought them to us. They will spend a few weeks in our quarantine room while we bring them back to good health. 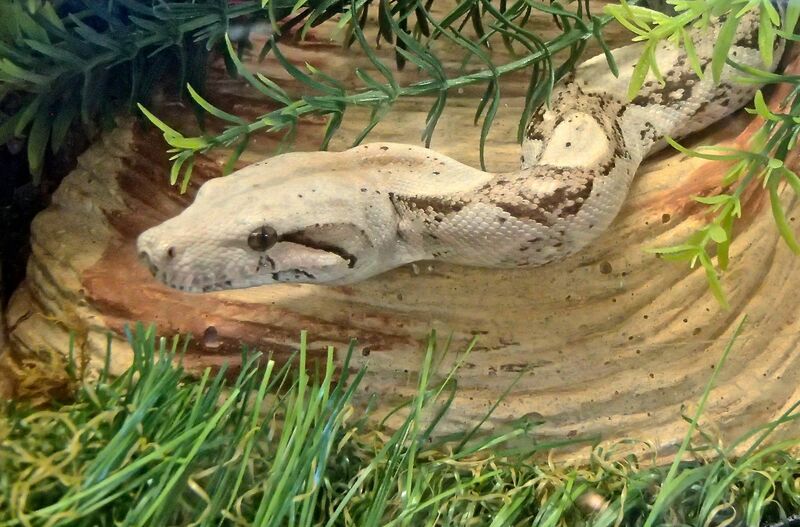 This Hog Island Boa comes to us from someone who is moving and doing some traveling. The Boa will be with us for several months until she sorts out her living situation. This is a common issue ( moving and can’t take the animal with them ) with people who have exotic animals as pets. It is common for those who have dogs and cats, too. People who keep exotics as pets run into several different problems. If they are moving to a strata complex chances are the strata by-laws will not allow exotic animals. The same goes for many landlords. Another problem is that friends and family usually don’t want to look after an exotic animal nor do they know how to look after the animal. Exotics require specialized care and don’t do well being shuffled from place to place. Most of the animals in our shelter are there because the owner’s life has changed and they can no longer care for the animal. This tropical snake is native to the rain forest islands near the coast of Central America. It is believed to be near extinction in the wild due to over collection for the international pet trade. Fortunately, increased protection of the islands, following the creation of the Cayos Cochinos Marine Protected Area (CCMPA) in 1993, significantly reduced the numbers of boas being collected illegally from the area. ( Biodiversity Science – July 2011 ). It is a constrictor snake. They don’t grow as large as Red Tail Boas. At maturity a Hog Island Boa will be aprox. 1.5 meters long ( 5 feet ). In the wild they will be found near water. They love high humidity. They have very beautiful colouration and patterning. Surprisingly, they can change their colour slightly depending on temperature, mood, health. Like all snakes they are carnivores and eat rodents. 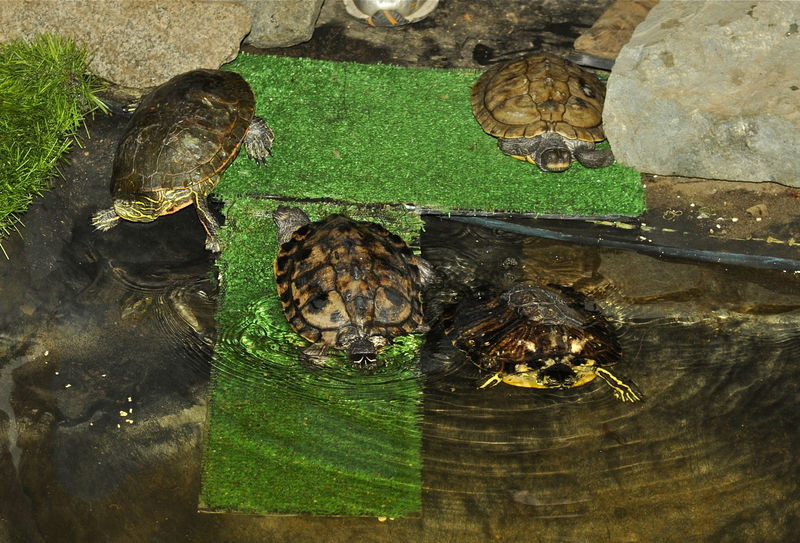 These four turtles were seized by the Okanagan office of Fish & Wildlife from a private owner who did not have permits for these animals. Fish & Wildlife called us asking if we would take in these animals and care for them. We have permits for these and many other animals in our care. 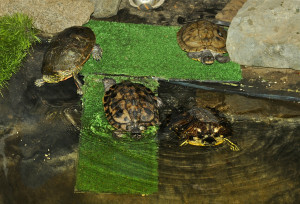 Of course we said we would take them so conservation officers arranged for the turtles’ transport. The turtles arrived safely and have begun their life in our indoor turtle pond where they will live out their natural lives. The day after taking in these 4 turtles we had another Red Ear Slider brought to us. We are now, unfortunately, at capacity for turtles. A Painted Turtle, Mississippi Mapping Turtle, and Western Pond Turtle launch into their new life in our indoor pond. Animals come to us in all health conditions (from good to quite bad). 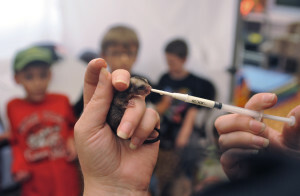 This tiny baby Sugar Glider lost his mom while he was still in her pouch, unable to fend for himself. Sugar Gliders are marsupials like kangaroos. This little guy was found clinging to his mother’s leg. So we took on the job of hand feeding the baby every two hours. We are hopeful the baby will survive. We have named him Simba and at the time of this photo, he is four weeks out of pouch. This little guy came to us a couple weeks ago. He is a cute cuddly Dagu but his dental care was neglected. As you can see from the photos, his bottom teeth were so badly neglected they were growing into his nose. He couldn’t eat or drink properly. As a result he was malnourished. The first thing we did was to take him to the vet to have his teeth trimmed. The first thing he did afterward was lick his lips. He is doing very well now, eating and drinking as he should. He has lots of energy and happily jumps around his enclosure. He is still cute and cuddly and loves to snuggle. He is doing so well and is so friendly he may start going on a few outings to birthday parties and schools. 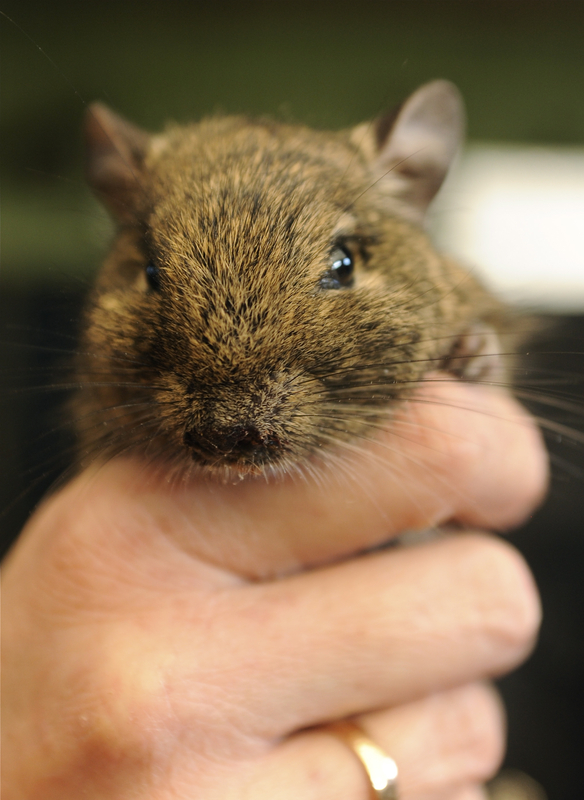 Dagus are a rodent related to the Guinea Pig and Chinchilla. They come from the semi-arid regions of the Andes Mountains in Chile. 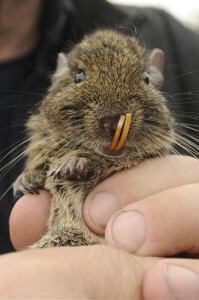 Being a rodent, they chew on everything and need a chew block in their cage so they can grind down their ever-growing teeth. They also prefer to be with other Dagus because they are a very social animal. They can make good pets but require a lot of attention and can be taught or conditioned to be friendly. They love to climb and therefore require an enclosure that has multiple levels. Specific Dagu food can be found at pet stores. A diet of too much fat or sugar (especially in the forms of fructose or glucose) will result in a diabetic Dagu. The vet mentioned this little guy may need braces … just kidding. We love a vet with a sense of humour! 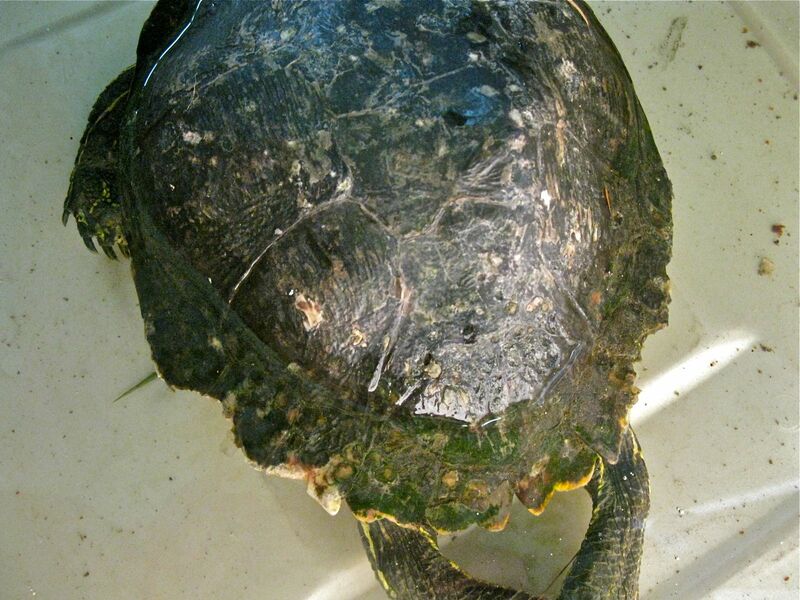 This Red Ear Slider turtle was rescued by a concerned citizen who had seen the turtle many times on logs in a pond behind a local Surrey school in a residential area. Recently, the person noticed the animal on the bank of the pond, not moving. She also saw some local kids peeing on the turtle. She walked up to the turtle for a closer look and found the turtle’s shell was damaged on the back, like it had been chewed on. The shell was also bleeding. She brought the turtle into our rescue facility where we cleaned the wounds, gave it a good rinsing to further remove the dirt, medicated it, and quarantined it from our other animals. It was a fairly old Red Ear Slider, one of thousands sold in the pet trade as cute, tiny green turtles only to be dumped in ponds, lakes, and waterways when it is no longer wanted. Unfortunately, this poor animal succumbed to its injuries hours after being brought in. No animal, great or small, deserves the neglect, suffering, and indignities that humans so often inflict on them. We need nature and nature needs us. One of our goals is to teach children how important nature is to each of us and to future generations.